Last weekend the entire UW Program squeezed into four cars and drove down to Corvallis, Oregon for the Pacific Northwest Regional, hosted by Oregon State University. UW Team 1270 started the tournament with two tough rounds against the University of Portland and Stanford - the tournament champions. The team made a comeback by dominating the third round against Washington State University. 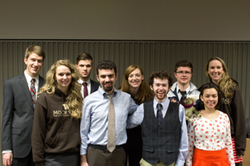 After a strong round against Berkeley, the team finished with a record of 3-5. Even though Team 1270 competed valiantly against some of the strongest schools at the tournament, unfortunately the team's record was not strong enough to earn them a bid to Opening Round Championships this year. UW Team 1269 started out the tournament strong, winning all four ballots in the first two rounds against Washington State University and Gonzaga. After splitting with UC Berkeley in the third round, Team 1269 ended the tournament by sweeping both ballots in the final round against Chemeketa Community College. With a record of 7-1, the team walked away with a Second Place Trophy, and a bid to the St. Louis Opening Round Championship. The UW Program received six individual awards this weekend! Congratulations to Sophomore Alex Melnik and Senior Rio Frazier for winning All-Region Outstanding Witness Awards! Junior Sara Leonetti and Freshman Lucas Heflin brought home the hardware for the attorneys, while Senior Amy Hersh double awarded as a witness and as an attorney! With the St. Louis Opening Round Championship coming up in less than two weeks, the members of Team 1269 are working dilligently to make changes to their case. Every year after regionals, AMTA releases case changes. This year's case changes are substantial; now the team is working with new charges and two new witnesses. After a strong regional performance, Team 1269 is excited to head to St. Louis and fight for a bid to the National Championship in Orlando, Florida.